The main event of UFC Fight Night 145: Prague features a Light Heavyweight contest between Jan Blachowicz (23-7) vs. Thiago Santos (20-6) on Saturday night, February 23 on ESPN+. For many American fans, this is a Thiago Santos fight against some guy named Jan. Santos is an up and coming pound-for-pound prospect, the hammer tattooed on his chest denounces the kind of fighter that he is. A hammer, a stand-up oriented striker who is going to look to take his opponents out of there unconscious and on a stretcher. The man is a predator in the cage, so the perception going into this fight for many is that this is a Thiago Santos fight, his opponent is all but a formality in the minds of many in this fight. Jan Blachowicz is a throwback fighter from the golden years of mixed martial arts, though he debuted in 2007, his second, third and forth fights all occurred on the same night at KSW-Elimination on September 15th 2007. The tournament formats were popular in the early UFC’s of the ‘90s and were one of many reasons the sport of no holds barred fighting gained the small, but loyal underground following that carried the sport through some very lean years. Fighting multiple opponents in one night is no easy task, especially in light of the general arrangement of today’s highly regulated mixed martial arts format where some fighters pray to even make it on to the preliminary cards for one fight. Blachowicz would go on to match that same accomplishment the following year at KSW 9 – Konfrontacja on May 09, 2008 where he defeated Martin Zawada by decision and Antoni Chmielewski and Aziz Karaoglu via submission (armbar). He would also go on to win two fights in one night at the KSW 13 – Kumite the following year in May of 2010, defeating Julio Cezar de Lima via KO and Wojciech Orlowski via rear naked choke. Blachowicz has been fighting multiple opponents on the same night throughout his career, and for this reason alone he makes my All-Violence First Team for being a game fighter despite the majority of his wins coming by way of submission or decision victory. Simply put, there is a reason Blachowicz is a nine-fight UFC veteran who is enjoying a four-fight win streak. He is a true blue mixed martial arts fighter, someone who is not going to lay down and allow the surging Santos walk right over him. Thiago Santos is going to have a fight on his hands and that is what makes this particular matchup so compelling. Thiago “Marreta” Santos has fluctuated between 185 pounds at Middleweight and 205 pounds at Light Heavyweight. Santos is currently on his own three-fight win streak, having won seven of his last eight. Fighting out of Rio De Janeiro, Brazil Santos has a 70% KO/TKO win percentage, meaning Santos is a head hunter who will be looking to collect Blachowicz’s scalp. Thiago Santos is the kind of fighter the fans want to see, a fighter who will keep their attention by practicing the exact brand of mixed martial arts we all tune in to see. 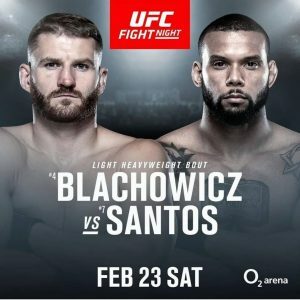 Santos is a real fighter, Blachowicz is a real fighter, this means the probability of the fans getting a good fight is quite high. With last weekend’s stinkers from Bellator and the UFC, mixed martial arts fans will be intently watching to see if UFC Fight Night 145: Prague in the Czech Republic comes through on ESPN+. The evenings co-main event will feature a Heavyweight bout between the 7-footer Stefan “Skyscraper” Struve (28-11) and eight-time UFC veteran “Pezao” Marcos Rogerio De Lima (16-5-1). Struve is on a three-fight losing streak and is in desperate need of picking up a victory Saturday night against a rugged and very tough veteran in “Pezao.” Though the strength of schedule of those three loses is worth noting, coming at the hands of some of the Heavyweight division’s toughest fighters in Alexander Volkov, Andrei Arlovski and Marcin Tybura. Struve will need to fight like his back is up against the wall, the Dutchmen hasn’t picked up a victory since October of 2016 when he fought against Daniel Omielanczuk and won via brabo choke submission. “Pezao” owns a 69% KO/TKO win ratio and will most certainly look to stand and bang with Struve, though preparing for a fighter of Struve’s size with his kind of length and reach can prove problematic for the ill-prepared. Marcos has also proved susceptible to submissions, something else the long Dutchmen could potentially use to his advantage in creating the kind of torque that only a giant can. At nearly a foot taller than the 6’1” Rogerio De Lima, Struve will be the larger man in the cage which will make this look very much like a David vs. Goliath showdown which are always fan favorites.